River’s Edge Garden Centre is more then just a garden centre, With the excellent advice and designs by Paul Berberich, he will create a landscape design that will fit your budget. Looking for an outdoor fireplace or a beach front retaining wall? Paul Berberich will design and install to suit your needs. With his knowledge on plants, he can design a new front entrance flower bed or even a poolside landscape with the best plant materials for the given environment. 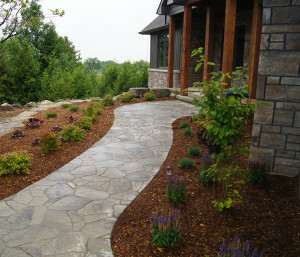 We have an excellent team of landscapers that can maintain your yard or help create that brand new flower bed. With a crew that has extensive knowledge of plants care, pruning and general garden maintenance, we will make sure you are happy with your yards new looks. Our hardscapers enjoy working and creating amazing patios, retaining walls and steps with natural and interlocking bricks. With many years of experience, we can create the right base for your patios to last for years with whatever design that you wish to include to your outdoor living space. We can carry a vast selection of natural stones and interlocking brick to suit your needs. Our team is committed to doing a great job and timely so you can enjoy your new outdoor living space as soon as possible. Book now to have a free consultation with Paul Berberich by contacting River’s Edge Garden Centre.